You feed the birds, shelter the birds, and even bathe the birds, so why not talk to the birds? These handsomely designed wood and rubber bird calls will get you closer to at least three types. 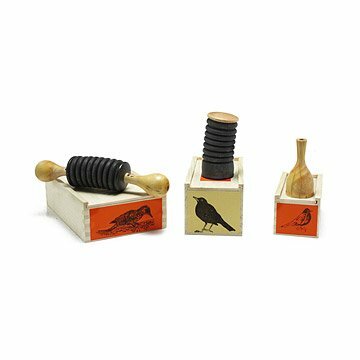 The Woodpecker (left), Blackbird (middle), and American Robin (right) calls are each packaged in a charming, slide-top wooden box complete with directions for use and bird fact card, making them a special gift for the amateur birders in your life. Handmade in the South of France. Sold individually. Click the bird to hear sound: American Robin, Blackbird, Woodpecker. Click here to read about when to use bird calls. Bird calls are a wonderful way to communicate with and observe birds. But birdsong is often a means of marking territory and your arrival may seriously disrupt the established balance. Nesting time is the most delicate part of a bird's life. Any random use of bird calls at this time could irremediably damage the lives of the young. Please act responsibly and use the calls only when there is no risk. Label color on each box will vary. The only call a bird should be making with this is "CHEAP, CHEAP, CHEAP!" Not only is it micro in size, but the product is poorly crafted and the "box" that it comes in looks like it was constructed by a five year old. It is great for more colors in a percussion piece that features all kinds of latin drums, and sound effects. Beautifully handmade, very realistic. My husband writes percussion pieces, and this was a gift. He said "I can already hear the music to write" when he started playing the bird call for the first time. gave it as a gift to my dad, who is obsessed with birds. it was a hit. although i have to say it looked less fancy then it did online. Love to get the family outdoors, this encourages the science mind. The blackbird call looked like the picture except the wood was black instead of the natural wood pictured in the catalog. (natural looks better) Being unfamiliar with birdcall devices, I wasn't sure exactly how it worked. Directions were vague. But the friend to whom I gave it as a gift seemed pleased with it! This was a gift for my brother, who is an avid bird-watcher and lover of unusual gifts. He loved the gift and was very impressed with the wrapping design and quality. Thanks! The bird call is used on quiet walks, backyard fun, and all around fowl communication, birds of a feather really flock together with this call.